The new President of Greece Alexis Tsiriras has left IMF bosses with Fetta on their chins after paying off his country’s massive debt and bailout fee with a 240 billion drachma ‘Wonder’ note. Despite first reports spread by the BBC that Mr Tsirias ‘stole’ the note off a blind, disabled, old lady after mugging her twice in the street it was revealed that actually, moments after winning the election, the new Greek premier simply cracked it off on the back of a beer mat while he was having a celebratory pint and packet of crisps. Hence ‘Wonder’ for ‘Golden Wonder’ which are Mr Tsiriras’s favourite flavour. When it was pointed out to Ms Legarde that this was more than three options and possibly six or seven she officially denied it stating she would never make such childlike errors about figures after all she was the CEO of the world’s most powerful bank. Explaining his economic strategy Mr Tsiriras laughed, ‘I don’t know why anyone hasn’t done it before. Surely it’s only as real or as unreal as the money the banks lend to us. Anyway, we have a little saying in our country, it was also the unofficial motto of my party, ‘Γαμώ the banks!’. 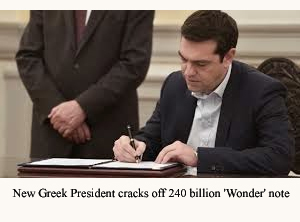 This entry was posted on 29 January, 2015 in homepage and tagged Alexis Tsiriras, current events, Ethan Harrison, President of Greece, satire, spoof news. Bookmark the permalink.